Facebook Live is a feature that will allow Android users to broadcast and stream live events on the social media platform. Facebook's popular Live Streaming service - Facebook Live, will soon start hitting Android devices. Live Stream is a Facebook feature that has been available to iOS users since early 2016. Android users will soon be able to access this feature, which is built into the Facebook app itself. With Facebook Live, Android users will be able to stream real-time events on Fabeook. The Facebook Live icon will be available on the status bar and will notify the user's Facebook friends when he/she goes live. 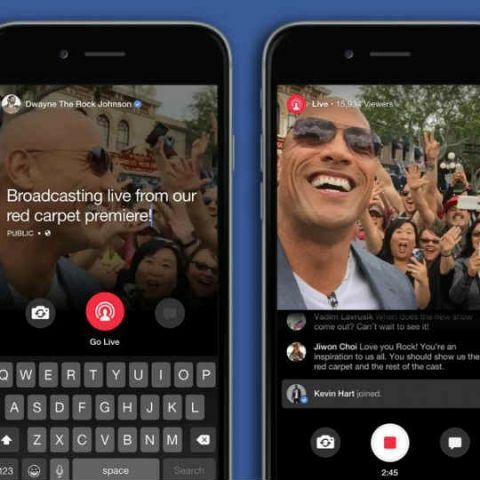 Facebook Live also allows users to put in a short description of their videos before starting the live stream as well as the ability to chat on the side with the viewers of the live stream. The company says that this feature will start rolling out for Android users in the United States as early as next week. A global roll-out is expected shortly after. Facebook Live has also been hugely popular with Hollywood celebrities, streaming their day to day activities live on the social media platform. Check out this video of Dwayne 'The Rock' Johnson giving a live tour of his gym on Facebook Live.